The evolution of flight in birds must have involved many dead ends, including all those dinosaurs with feathers that never evolved to the flying or gliding stage, or even the flying lineages that went extinct—like all dinosaurs except the single lineage that produced modern birds—when the asteroid whacked us at the end of the Cretaceous. A just-discovered species of dinosaur, described in a new paper in Nature by Xing Xu and colleagues (reference and free link at bottom), was almost certainly one of those failed experiments in flying or gliding. The species is remarkable for two things. First, instead of having feathered forelimbs like the early ancestors of birds, it had a naked membrane stretched between the digits of its forelimbs and its body. (It did have feathers, but not on the wing membrane.) In that way it was like bats or pterodactyls. But pterodactyls weren’t dinosaurs, and so this finding, which is a winged theropod like its feathered cousins, is unique. Sadly, only one specimen of this beast was found, and it’s missing the rear bits, including the crucial tail, which could have given us some information about how it glided or flew. In fact, we have no idea whether this one glided, flew, or both. You can see the feather impressions above, and they’re outlined in light gray in the diagram below. There are filamentous feathers all over the body, though not on the membrane. So here are the crucial bits: the “styliform elements” that are an extension of the wrist, certainly produced by selection to support the membrane. Those bits are represented by “lse” (left styliform element) and “rse” (right styliform element) in the diagrams above. In the picture below the right styliform element is singled out (“ru” and “rr” are the ulna and radius respectively, the lower arm bones that we also have. The best way to see that these bones are extensions from the wrist is in the yellow diagram above, where the left styliform element (“lse”) extends out to to the left from the wrist, where the fingers (lmd [left manual digits] 2, 3, and 4 originate. The shot below shows patches of membranes; as the authors say, “sheet-like soft tissue associated with the right forelimb (yellow arrows point to patches of sheet-like soft tissue)”. There’s an analysis of the phylogeny of this specimen, but that needn’t detain us here; suffice it to say that it nests within the other theropod dinosaurs, and so is not at all a pterosaur. For comparison, here’s a pterosaur, also showing the wrist extension (the small “swordlike” bone coming off pointing at the shoulders), and the enormously enlarged single digit that supported the wing membrane. That was also digit #4, so there’s a case of convergent evolution here with the specimen above. You can also see that the rest of the fingers simply stuck out from the wing. So, what we have is one of evolution’s luxuriances: a cool lineage that may well have included fliers or gliders, but didn’t form an ancestor of modern birds—though it may have been close to that ancestor. It doesn’t tell us much about how modern birds evolved, but does affirm that the lineage we have today, as with many other groups like horses, involved many related branches that died out without leaving descendants. Modern birds are the lucky ones (especially the ones that eat my seeds!). Xu, X., et al. (2015). A bizarre Jurassic maniraptoran theropod with preserved evidence of membranous wings. Nature advance online publication. This entry was written by whyevolutionistrue and posted on April 30, 2015 at 1:09 pm and filed under birds, evolution. Bookmark the permalink. Follow any comments here with the RSS feed for this post. Both comments and trackbacks are currently closed. Excellent. I saw the piece in the Times today and wanted more details. Thanks for providing them. Is it a bird or a wing’ed-rat? Feathers too, and a tiny brain. Glidin’ on the wind, look out b’low! Swooping low, mammals take a breath. Does whatever a Dino-bat does. Thanks, that was an interesting read with my lunch. I don’t comment on these science articles because I haven’t nearly the expertise to add anything, but as to your concerns earlier about how your audience valued them, I value them as much as if not more than the religion articles – I actually learn something with these! From a comparative embryology/anatomy perspective, the skeletal elements in the wings of Yi qi seem very bird-like. Digits 2, 3, and 4 are those you see labelled in images of the developing wings of chicken embryos; however, the specific arrangements and numbers of phalanges and metacarpals are different. IIRC, in modern birds, the metacarpals of digits 3 and 4 are fused (or appear so) in the “primaries” portion of the wing, and each has some phalanges. Digit 2 just has a phalanx, and no metacarpal (again, IIRC). In addition to the special styliform element, Yi qi has metacarpals for each of digits 2, 3, and 4, and lots of phalanges for digit 4 (phIV1-4 in one of the inset photos above). From a paleogenomic perspective that variation may be one of the most interesting data points in working out the regulatory cascade mutations involved in the formation of the avian state. As small theropods are among the least liable to get fossilzed with full bodies, it is wonderful we have as much data as we have (and yet another indicator that the Intelligent Designer camp’s wished for Designer must really love evolutionary paleontologists, to have so presciently littered the fossil record with critters guaranteed to give them shivers of delight). Very good. I was trying to parse this out, but you did a much better job than I ever could. Since the styliform element is so very enlarged in this new species, I think it will be important to go back and look at other little therapods to see if they have any even slightly elongated wrist bone. It is possible that they have been overlooked. So there were dragons after all! Mre seriously, many thanks for this analysis — fascinating stuff. A dragon with bat-like wings. So, indeed, dragons, did exist, albeit small dragons. I also have no specific comment, but I want to be sure the ceiling cat knows that I appreciate science articles like this one very much! Yes, absolutely. A very cool dinosaur. I hope they find more fossils so we get to see it complete. Me too. This is fascinating stuff. My only (naive) thought is that a heck of a lot of variation and selection must have gone into that sophisticated structure. The feathers look rather primitive and not aerodynamically formed. I’d say it was most likely a glider. The muscles don’t seem strong enough for wing flapping, on the other hand, I can’t find a sternum in the fossil. Do bats have deep sterna like birds? Bats have a relatively strong sternum, somewhat keeled, but nothing to compare to the avian breastbone. They are nevertheless highly efficient flyers. No, but you need attachment points for strong muscles. In this birdbatdino I’d expect something birdlike, if he’d be able to fly actively and not just glide. Hopefully more fossils will show up, so we can find out more. it’s a supremely curious and yet cool dinosaur. i suspect the true complexity of their lineage has yet to unfold for us. We already know it was far from the old Social Darwinistic view of maladapted and stupid lizards, doomed to be out-competed by nineteenth century Tory voting Englishmen. I just showed this post to my students (high school advanced biology) and they think it is really cool. Well…Sue couldn’t fly, but she was big and badass. Does that count…? No offense to Adrian Desmond, but his popular book was a way long time ago in paleontology circles, like talking faxes & VHS vs Beta. The arboreal vs cursorial debate still smolders a bit, but it seems increasingly irrelevant when trying to assess what small feathered maniraptoran therapods unknown in 1980s were up to. As none of the earliest birds had well-developed sternum attachments for flight muscles (that came later in the Cretaceous), many may have got airborne by jumping from a height. How much of this was done in particular groups by climbing (and their hand claws and feet arrangement made this perfectly feasible) or leaping from low escarpments after getting up to a good run is hard to say. The recent experimental modeling of Microraptor suggested they were quite capable of tree-to-tree glide and grab hold landing on trunks. Close cousins of those tyrannosaurs (now regarded as jumbo- coeleurosaurs) probably had many options for flight that these snapshots found so far only hint at. Aside from the incorrect Greek pluralization, this is funny. ?Huh? Scansoriopteridae [family] and suprageneric taxa in general ARE plural, are they not? 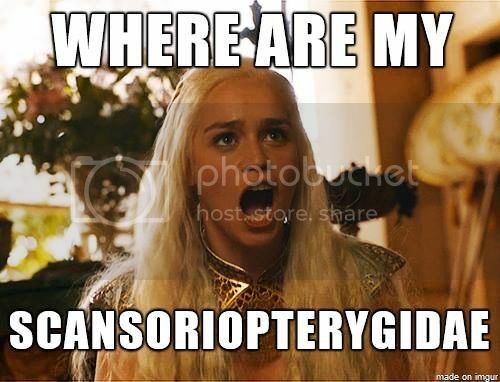 It’s correct as the genitive which the family is using, but in this she seems to be referring to more than one Scansoriopteryx which would be Scansoriopteryges. Scansoriopterygidae Czerkas & Yuan, 2002 is indeed the correct name of the clade including the genera Epidendrosaurus, Epidexipteryx and now Yi. Scansoriopteryx turned out to be a junior synonym of Epidendrosaurus but the family name based on it is still valid. Yes and I think the character shouts, “where are my dragons” so the Greek word should correspond! That would seem to constitute confirmation that your students do, indeed, have a pulse. If they hadn’t found it “really cool,” I’d have been more than a bit worried…. They sometimes, especially this time of year, especially the seniors, appear to lack a pulse. Oh, I know that feeling…I had senioritis from…oh, about eighth grade until…well, honestly, I probably still have at least a touch of it…. I should have said, “as well”. They would be challenged. But how else would they be on the ground? The hands aren’t the important bit when it comes to vault-launching. Pterosaurs have huge upper body strength because, unlike birds, they both power their flight and takeoff with the forelimbs. A decent-sized pterosaur could takeoff from water. I’m talking about how the animal actually gets into the air. Most birds do it by leaping/falling into the air and then flapping their wings once they’re off the ground. To do that, they use leg power to kick off, which means the ratio of leg muscle mass to arm muscle mass has to take that into account. That’s why, for instance, water fowl run across the water before flying. Pterosaurs can launch themselves into the air with all four limbs – basically vaulting themselves into the sky rather than kicking off the ground – meaning the front limbs play a much greater role in the launch. This is not only more energy efficient than bipedal takeoff (because the power is shared across all four limbs), but it allows much stronger muscles in the forelimbs, which also helps the actual powered flight when the pterosaur starts flapping. That’s why the hands aren’t actually important. Even for birds whose feet range from tiny perching claws to giant wading pads, the real power for takeoff comes from the upper leg. That’s why “eentsy” fingers don’t matter that much. I learned this while reading Mark Witton’s book on pterosaurs. It is truly a fascinating read; I’ll never look at pterosaurs the same way again. Thank you, that makes great sense! I may have to look into that book. Pterosaurs did not have the “hollow” (air sac-full) bones that bird do, did they? I’d been noticing that the Sandhill Cranes that feed in our field are very slow to take to the air when the dogs & I come by on a walk. They’ll vocalize and start walking away, but it’s only when we get pretty close that they’ll take to the air. It occurred to me that, although they’re elegant flyers once aloft, it must be awfully hard to get that much bird off the ground in the first place. It would seem to me that on takeoff they couldn’t even do a full wing down-stroke without striking the ground! I’ll have to keep watching and try to observe that upper leg kick-off. I love to watch waterfowl and pelagic birds run across the water pre-liftoff! Oh, they did. I don’t think they have it to the same extreme degree as birds, though, and some of the earlier pterosaurs (like Dimorphodon) had more solid bones than later ones (like Quetzalcoatlus). I’ll have to keep watching and try to observe that upper leg kick-off. It’s really hard with some of the smaller birds. I’ve tried to see the kickoff with the house sparrows in the bush outside my house, but it always looks to me like they just snap straight into flight without the kick. Crows, magpies, and pigeons are much easier because they crouch right before launch, and there’s always plenty of them lurking around where I am. Oh, very cool about the pterosaur bones! Another adaptation arising independently in different lineages. Regarding the kick-off–now that I know what to look for, I suspect it might be especially visible in Sandhills. I also have a one-legged crow that’s been around for several years; I’ll definitely have to give him some close looks! I took my adult son on a pelagic bird trip out of Newport, OR, last year. I’ll never forget the birds-running-on-water–especially the Brown Albatrosses, but also the shearwaters and other species. An entire realm so few of us are ever aware of. It is a very handsome book … I just haven’t found time to read my copy yet! Probably worth pointing out that the upright quadrupedal posture is likely restricted to the more derived “pterodactyloid” forms, as opposed to the basal “rhamphorhynchoid” species. I’m not sure I’d call this a failed experiment in flying. The fact that the styliform elements are so well developed surely indicates a considerable degree of evolutionary success; i.e. the lineage must have been positively selected for quite some time to reach that level of specialization. I’m also hoping this is merely the vanguard for a whole host of discoveries. I remember my excitement, back in the day, when we went from obscure theropod claws to a whole new group of dinosaurs – Therizinosaurs. 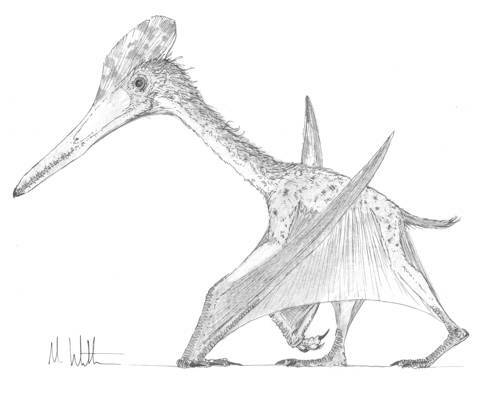 Given _Yi qi_’s apparent affinities, I wonder if anyone is going to take another look at _Scansoriopteryx_ and _Epidexipteryx_ soon, especially given all the speculation over the function of the hyper-elongated 3rd digit in the former. I was extremely pleased to discover Yi qi – and I agree with Gregory: this critter was not a “failed” experiment. Even if it is known by only one fossil, it can very well have existed for a longer time than our own species. The length of the digit #4 and of the styliform element suggest actual flight rather than mere gliding. But the most important thing is that it evidences another independant evolutionary development of flying capacities among vertebrates. Keep watching the Chinese Jurassic. Nothing would be surprising now. The most unusual thing about this animal is that it’s the only one to have been found. It’s clearly quite specialized and is hardly a basal form of membranous fliers. There must be ancestral forms awaiting discovery or lying unrecognized in some museum collection. It’s also hard to imagine that there was only one species with this degree of specialized adaptation. it will be interesting to see what turns up now that folks know what to look for. Skin gliding (or something similar) has evolved independently several times (including in snakes), so I’m not surprised that a lineage of dinosaurs (interesting that it’s therapods again; they might have been ‘pre-adapted’) developed the ability. Powered flight is something else. As PCC points out, only pterosaurs, dino-birds and bats have managed that feat. If 翼奇 could fly, that would be two for dinos, three for the archosaurs and merely one for mammals. Given the odds against ANY organism being fossilized, it’s highly probable that there are literally tens of thousands of species of ancient creatures of which we will never see a single example. Among extant gliders, I’d give frogs like Rhacophorus [Wallace’s flying frog] the best pre-flight model. Shame we’ll finish off the remaining anura in a century or so. Thank you. Much more informative than the CBC article I read this morning, especially all your comparisons with other species. I think it’s a good example to show people who don’t realize there were no “participation” trophies with natural selection. Can someone please explain this to me? I thought I understood at least the fundamental concept of evolution but I can’t figure out how the process could conduct “experiments”, either literally or metaphorically. Nature performs experiments all the time, in the sense of variations that either do or do not lead to long-term successes, and in representing alternative modes of adaptation or novelty give a bit more or an idea of what does and doesn’t work. There is no intimation of intentionality or purpose behind this usage of experiment. The 4 winged Microraptor & this new dino-bat apparently failed to make the cut compared to the Archaeopteryx-format,. Similarly, the bipedal teetertoter tail-balancing small mammal that showed up in the Messel Lagerstatten didn’t appear to be a particularly prolific “natural experiment” either, leaving no discernable lineage. Nature performs experiments all the time, in the sense of variations that either do or do not lead to long-term successes, and in representing alternative modes of adaptation or novelty give a bit more or an idea of what does and doesn’t work. This confuses two different things, though. It’s true natural selection whittles out unsuccessful variants within a species or gene pool, but that’s totally different from variations between species, such as Yi qi and other dinosaurs. In fact, it’s not even suggestive. The success of a body plan isn’t necessarily measured by how many species diversify from that plan. Extinction and species diversification are more luck-based and chaotic than natural selection, so aren’t very good indicators of how “good” or “bad” a body plan is. Besides, if a body plan “didn’t work” (in what context, by the way? ), it wouldn’t evolve by natural selection in the first place. Body plans are rather far up the systematic food chain from the issue of whether a lineage succeeds or fails in the long run, and pondering why. All species eventually die out, but tetrapods are alive and well, even as no non-avian dinosaurs made the cut. Seeing the success of birds and extinction of their cousins naturally raises issues of whether it was all (not merely mainly or mostly) just stochastic crap shoot, or whether features like the ability to fly to another rock contributed to their survival while the non-fliers had to hoof it and not get munched by increasingly stressed groundlings. Short of a time machine, all we have are the broadest gathering of data and reasoned assay of it, but declaring it to be all luck seems to be assuming what it is that is supposed to be the object of the proof. The likes of Microraptor and Yi may have spawned many descendant lineages, or not. At the moment both seem highly isolated and it seems an eminently appropriate paleontological topic to wonder whether the reason for that turned on their particular adaptations proving less fertile in staking out niches that were successful over the long haul. My point is that describing Yi or Microraptor as “failed experiments” but Archaeopteryx as a “successful experiment” – based on whether they diversify or not, for instance – is an unhelpful metaphor at best, and a positively misleading one at worst. This isn’t about whether extinctions follow certain patterns or not. Compared with the logic of natural selection, they are luck-based. We’re talking about adaptations. Adaptations arise in lineages to increase individual chances of survival and reproduction, ultimately to propagate genes. They don’t arise to pit species against species, much less whole taxonomic groups against taxonomic groups. For one thing, it’s snobbishly judgemental in the Victorian “extinct animals are inferior animals” sense, born almost entirely from hindsight and a vague concept like “success” which is meaningless in context. Pterosaurs, for instance, were incredibly efficient flying organisms, but it’s best to explain that via the natural selection of aerodynamic bodies with modified limbs and mechanical factors, not by talking as if reptiles fancied to try their luck in their air as an “experiment” and entered competitions against birds. For another, the example you cite is transparently luck-based. An adaptation is already in place in your hypothetical scenario comparing flyers against grounded cousins, and since the deciding factor is environmental, from an evolutionary perspective it IS luck-based. There was no way the evolution of the wings was somehow deliberately aiming to prepare for or test models against the sudden environmental change, so the fact that it fits is simply lucky. It’s not that the traits are irrelevant, of course, but you only need to invoke histories and physical-mechanical aspects to explain this, not some metaphorical evolutionary experimentation. Lastly, again you’re confusing different issues. That certain adaptations could translate well when thrust into another environment compared with others, and that this is a valid topic of palaeontological study, is not the issue. The issue is describing evolution as if it “experimented”, which apart from the teleological implication, mischaracterizes the above-mentioned topics. Dr. I. Needtob Athe is right. Evolution doesn’t conduct experiments, metaphorical or literal, so describing an extinct species as a “failed experiment” is either meaningless or a gross misunderstanding of how evolution works. I don’t see teleological implications in the differential success of the natural experiments that you do not perecive to be natural experiments at all, so how much “gross misunderstanding” is going on here (as opposed to definitional frames) I’ll leave to others to assess. It seems we’re treading on a deep conceptual gulf though, much as Alfred Wallace just wouldn’t budge on not seeing the analogies of artificial selection with natural selection that Darwin thought so apparent. I think people can easily grasp the use of teleological wording to describe processes like these, just as they understand, “the water wants to flow downhill,” or “the seed wants to land in an area conducive to germination.” Thinking they can’t is another sort of “little people” argument, and at worse can result in very opaque writing or speaking when trying to avoid it. I worry, though, because that kind of metaphorical teleology is often concretised by creationists and their ilk. Don’t worry so much on that front, as absolutely everything anyone can say can (and usually has been) parsed & filtered & quote-mined by antievolutionists to serve their apologetic purpose (I keep track of this sort of thing in my new #TIP project at http://www.tortucan.wordpress.com, such as TIP 1.3 on the Punctuated Equilibrium case). Some statements made by scientists are more easily mined than others, of course, but trying to second-guess the antievolutionist radar is a thankless & futile task, better just to stick with assessing the fullest range of relevant data as best one can and let the apologists parse as they will. Well of course one has to qualify one’s audience. But when I see biologists telling biologists that they’re being too teleological, I just want to tell them to get off their friggin’ high horse. Nor do I think we need to worry about the WEIT audience. With any luck at all. Metaphors exist for a reason. We like them, and they can be suitable shorthand. Cool. Thanks for the comparisons to pterosaurs and bats. “…it’s missing the rear bits, including the crucial tail…” God is always teasing us. Holy crap. I leave for a few hours, and a really cool post comes up. I gotta just keep my laptop with me at all times, I guess. posting in WEIT from my phone is a pain. At least I cannot get it to remember me from Safari so each time I need to enter my name and e-mail, etc. Force your phone to give you the desktop site if you aren’t getting that one. I have google desktop on my iphone, and even if I log into my gmail there, in WEIT I still have to enter my gmail email and pw in WEIT. Having looked into this more, I think it is a keychain access feature that I need to work on in Safari. I need to put this site into my keychain and tell Safari to use it. We will see. Do yo not have a WordPress account? “Phone” seems so inadequate to describe the device we now have. Fascinating; this opens a whole new sphere of dinosaur possibilities. It doesn’t look to me as though it had the right proportions for actual flight, but who knows, and it was certainly well on the way. Maybe its descendants could have done it even if it couldn’t. From the scale bar, it looks like this dino was maybe about the size of a large jay or small crow, so the proportions aren’t too far out of whack for a flying creature of that size. Oops, I didn’t notice that, I thought it was more chicken sized. Even more awesome then. Thanks A LOT. This is fascinating. I envy scientists who can learn so much from so little. My daughter and I are equally excited about dinosaurs, so it’s going to be fun talking to her about this. What an approachably worded, patient explanation! Thank you, Professor. Very interesting post. Many thanks. Scientific names have been devised using words from hundreds of different languages apart from Latin so nobody expects the etymology to be transparent, which is why it’s nearly always (these days) explained in the paper. I knew a girl at uni whose Chinese given name was Yi-Chi (because she was born on Chicago). I doubt whether I could detect a phonetic difference between her name and this new dinosaur’s, but I know they mean different things because she didn’t look anything like a Skeksis. Born on Chicago. She must have been big. Apparently sometimes people use numerals, though I am not sure I’ve seen them outside a dictionary. So this might be (e.g.) yi2 chi3. I don’t have much to contribute to this discussion, but it is fascinating, nonetheless. Thank you for posting it. The colouration in the imaginative reconstruction is interesting. I am aware that some research has established (or strongly suggested) that at least a proportion of dinosaurs sported brightly-hued feathers or crests. Out of curiosity, where does this specimen fit in that timeline? Might it have been brightly coloured? Have we learned or inferred anything about the appearance of its closest relatives that might shed light on its appearance? Thanks for posting. Love this kind of stuff, with the comparative anatomy and whatnot. I googled, but didn’t find a definitive answer. Can anyone say how many species are known by only one specimen? I’m sure it’s a good fraction. Thanks! I wonder if some kind and knowledgeable reader might be able to point us in the direction of a piece, or pieces, describing the different evolutionary paths of flight/gliding? I’m aware of a few big picture reviews, starting with a work on the biological dynamics of controlled arboreal falling that may have played a part in all vertebrate flyers. Dudley, Robert, Greg Byrnes, Stephen P. Yanoviak, Brendan Borrell, Rafe M. Brown, & Jimmy A. McGuire. 2007. “Gliding and the Functional Origins of Flight: Biomechanical Novelty or Necessity?” Annual Review of Ecology, Evolution and Systematics 38: 179-201. That the avian flying capacity built on prexisting anatomical range discussed in Nudds, Robert L., & Gareth J. Dyke. 2009. “Forelimb Posture in Dinosaurs and the Evolution of the Avian Flapping Flight-Stroke.” Evolution 63 (April): 994-1002. For the possible role avian feet played in the stability of perching and take-offs, Kurochkin, E. N., & I. A. Bogdanovich. 2010. “Origin of Feathered Flight.” Paleontological Journal 44 (December): 1570-1588. And then there’s Dececchi, T. Alexander, & Hans C. E. Larsson. 2011. “Assessing Arboreal Adaptations of Bird Antecedents: Testing the Ecological Setting of the Origin of the Avian Flight Stroke.” PLoS ONE (online @ plosone.org) 6 (August): e22292. Look at the skull. Diapsid (two windows in the skull – and a spare!) with a mandibular fenestra (“window” – as in Prague). Not quite definitive of a dinosaur (you need the ankle and femoral socket to nail it down), but by the time you’ve seen those, you’re close enough to “dinosaur” for non-specialists. It’s a cool find, but the link to the paper isn’t free. I’ll try to snarf it off the work’s connection tomorrow – I think they have a site license to Nature. Reblogged this on My Selfish Gene. It is a great transitional between pterosaur and primitive bird.